Three weeks ago, Washington State was riding high with a spot in the Top 10 and a quarterback being mentioned as a Heisman Trophy candidate. Then the Cougars lost two of their next three games, and quarterback Luke Falk was pulled from last weekend’s loss at Arizona for failure to move the team. But there is no panic in Pullman. Coach Mike Leach said Falk will start Saturday against No. 18 Stanford, and the 25th-ranked Cougars still control their own destiny in the battle for the Pac-12 North. Washington State (7-2, 4-2 Pac-12) rose to No. 8 after beating Oregon on Oct. 7. Falk rose as high as fourth in some Heisman Trophy prediction polls. Then the Cougars laid an egg at California, losing 37-3 and failing to score a touchdown for the first time since 2012. They rebounded to beat Colorado at home 28-0. Then came last weekend’s game at Arizona. Falk started and led the Cougars to one touchdown. But of his seven drives, five ended in punts and one in a long missed field goal. Leach pulled Falk for Tyler Hilinski late in the second quarter. Hilinski went 45 of 61 for 509 yards, threw two touchdown passes and ran for two more scores. But he also threw four interceptions that helped Arizona pull away to a 58-37 victory. Leach has been critical of Falk several times this season, complaining the former walk-on sometimes overanalyzes what he’s seeing on the field. 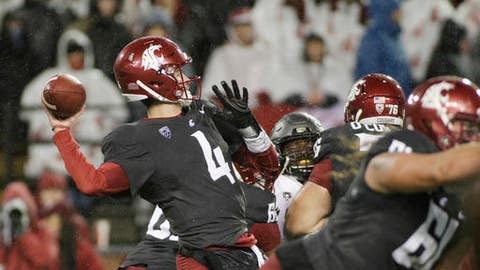 ”He is the most successful quarterback in the conference,” Leach added. Falk is the NCAA’s active leader in passing yards with 13,469; touchdowns with 112; and yards per game at 336. With 25 career wins, Falk is also the winningest quarterback in WSU history. He needs five touchdown passes to break the Pac-12 career record of 116 held by Matt Barkley of Southern Cal, and 132 passing yards to break the league record of 13,600 held by Sean Mannion of Oregon State. Yet Saturday’s game was the second time he has been benched this season. Hilinski relieved him against Boise State and led the Cougars to a triple-overtime win. Falk, in his fourth year as a starter, has taken it all in stride, Leach said. ”I think he’s pretty well handled anything football-related excellently,” Leach said. Through nine games this season, Falk has completed 68 percent of his passes, for 2,576 yards, 23 touchdowns and seven interceptions. But his past three games have seen production well below his season averages, and Heisman talk has mostly ended. Leach saved his most critical remarks for his defense, which once was ranked in the top 10 in the nation but has fallen to 17th with poor performances at Cal and Arizona. ”We had eyes in the wrong place, and some alignment issues,” Leach said. Falk and the other Washington State seniors will play their last game at Martin Stadium on Saturday against Stanford (6-2, 5-1). The Cougars are battling Stanford and No. 12 Washington for the Pac-12 North title. The Cougars face Washington in the Apple Cup on Nov. 25.